Shopping for ergonomic seats for the car? See our recommendations. Ergonomic car seats greatly help in reducing the stress and strain on the muscles. and the entire skeletal system and helps in reducing the possibility of development of any ergonomic problems. The ergonomic car seat is recommended especially for long driving. These seats are structured in such a way so as to match with the body's natural shape. These car seats adequately support the neck, back and hips. Moreover in case of any rear collision accidents, ergonomic car seats can help save lives of the car's passengers. These seats have specialized structures which absorb the impact of the collision causing the backrest to remain sturdy and safety seat belt to function fully during the collision. Is your car seat ergonomic enough? If you are wondering whether it is ergonomic or not, then read on to find about it. When you sit in the driving seat, check out how comfortable it feels. If your legs are extended fully and your hands are comfortably resting on the steering wheel and your back is also comfortably leaning and is in contact with the back of the car seat, then it means your car seat is sufficiently ergonomic. To determine whether a car seat is ergonomic, check to see of you can adjust the car seat according to your height. An ergonomic car seat should make you reach the brakes quite easily and your feet should be comfortable while doing so. Moreover, you should be able to turn around comfortably when in the driver's seat. Furthermore, a comfortably good car seat would let its passengers get in and out of the car quite easily. If you can't do it with ease then opt for a good seat. Ergonomic car seat would not be firm or stiff; they would have a certain level of 'bounce' in them. If they don't bounce it means they are stiff. Ideally, you should be able to adjust these seats in upward and downward direction as well as in back and forth movement. 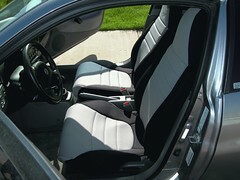 Furthermore, these car seats should have reclining back so as to avoid lower back pain. A few more things to take into consideration is whether you need to add an additional lumbar support or back supports to support your lower back. The ergonomic car seat benefits us in several ways. They help in relieving back pain which is caused by sitting incorrectly in the car seat thus you maintain a correct posture. These seats help in strengthening your back muscles while you are sitting. Moreover, the support enables you to keep your head and neck aligned to the spine. Ergonomic seats give support to your pelvis too. Furthermore, you are saved from the fatigue caused by prolonged sitting. You can add lumbar back support pillow to your car seat. Its gentle curve will help in supporting your back. You can also consider using the ergonomic seat gel cushion to your car seat. These cushions help in reducing pressure on your tailbone and the soft tissues. You might be interested in Driving Ergonomics. If you are looking for a good ergonomic car seat, then try the TruComfort II Seat and Back Support. It is an ergonomically designed car seat with an excellent back support system. It will help in reducing the stress on your body caused by poor sitting habits. This car seat comes with an adjustable lumbar support which is designed specifically to ease the lower back pain. It is indented at the center thus limiting direct pressure to be put on to the spine. These car seats are easily adjustable to individual needs. You can remove them easily when not in need. These car seats are ideal for back pain sufferers as well as frequent travelers and drivers of buses and trucks. You can order for these online through the website of TruComfort. Another good option is the Recardo Ergonomic Car Seats. They have lots of variety. You can try the Ergomed ES car seat which has integrated heating in the seat's cushion and backrest thus relaxing your muscles. Its headrest can be adjusted according to your height. It offers better thigh support thus relieving muscle tension. See also Wagan IN9988 Black 12V Ergo Comfort Rest Massage Magnetic Cushion . Hercules Products have a great product, it is called the Gray Seat Cushion which pertains to all the necessary requirements of an ergonomic car seat. This car seat gives you comfort while sitting in the car as well as gives your car a cool new aesthetic look by covering up the old, dirty car seat. This car seat Ergonomic Seat Cushion - Black fits into most of the cars and is very easy to install. It is designed in such a way so as to relax you as well as massage your muscles while you are driving. Moreover, it serves the ventilation purpose too. See a wider range of car seats that are ergonomic here. Thank you for reading 'Car Seats Ergonomic'! Go back to Cycling, Bicycles, Bike, Car Ergonomics.